Presented at the Rome Biennale in 1973, Pittura 4 (Painting 4) was one of a large sequence of paintings made by Scanavino to exemplify the archetype of a relationship between two entities. 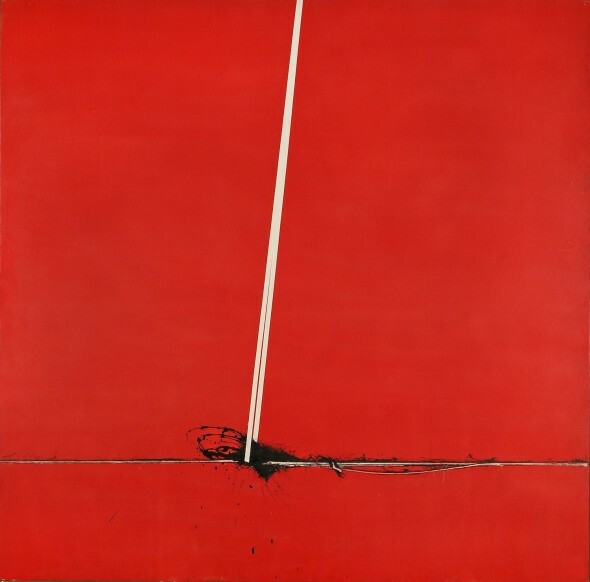 Through his use of the colour red the artist seeks to express the idea of an emptiness which is then interrupted by a “sign”. This idea is one that Scanavino continued to investigate during the 1970s and can be seen most notably in his monumental work from 1977 La porta (The Door). In Painting 4 the point at which the lines meet seem to combust and create a new energy. In the present work we can see Scanavino’s gestural method as an action of awareness and one that is always controlled. Unlike the Abstract Expressionists of the 1940s and 50s Scanavino’s work is not conceived of uncontrolled gestural strokes. The drips, scratches and lines are in fact all created in such a methodological manner so that each entity was manipulated from beginning to end. Luciano Caramel comments on this approach of Scanavino’s towards the canvas stating that “an extreme need for cleanliness, neatness”; he seeks “order” to “anchor everything in its place […] the immediacy of the gesture is as though forced to slow and the backgrounds become more terse”. Luciano Caramel, Galleria Morone, Milan, 1984. The artwork described above is subject to changes in availability and price without prior notice. Where applicable ARR will be added.